Being one of the very popular delicacies Indian barbecue has survived many years of perfection. India's version of barbecued chicken is the world famous, bright red "Tandoori chicken". 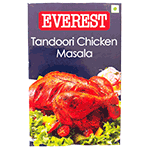 Tenderized in a yogurt marinade, seasoned with Everest Tandoori Chicken Masala is simply the best. Product of India.